Parfum Initial opens with Shalimar’s signature top note of bergamot, however the bergamot is very much muted in comparison to the original’s blast of citrus. The iris comes through very quickly, powdery and rooty and ever so slightly cold. There is a tinge of something bitter, like liqourice, lurking in the background. The coolness of the opening doesn’t last for long, this is an Oriental scent after all. The florals and candied fruit are sweet, and add a warm, burned sugar nuance that works beautifully with the vanilla and tonka in the base. The powder of the iris keeps going throughout the development of the scent and whilst the powder aspect is velvety soft Parfum Initial feels considerably more powdery than the original. In place of the smoky base of the original Wasser has used a soft white musk, which coupled with vanilla and tonka gives Parfum Initial a wonderfully sweet base. The musk, which could have cheapened the base adds to the velvety texture of the fragrance. If what you love about Shalimar is the big dose of ‘skank’ then you may be disappointed with Parfum Initial, the skank and smoke have been completely removed. That said, Parfum Initial cannot be described as a clean scent, it retains the balsamic aspect of the original thanks to a touch of patchouli. Shalimar Parfum Initial is unmistakably Shalimar in it’s DNA and Thierry Wasser has done an excellent job in modernising the original. I wouldn’t say that Parfum Initial is a fresher take on Shalimar (in the same vein as Eau Legere, Shalimar Light and Eau de Shalimar) but it certainly is lighter and less dramatic. In the recent BBC4 Perfume documentary Wasser explained that when it comes to creating a Guerlain you cannot ‘betray the book’ (the old formula books) and in this case, I believe he has respectfully created something that does not betray the Guerlain perfumers of the past. For those who are intimidated by Shalimar’s smokiness or animalic notes, Parfum Initial is a lighter, easier to wear alternative. For those who adore Shalimar (I include myself here), this is a beautiful, every-day alternative to the drama of the original. The juice is a beautiful blush colour and the bottle is a slightly less squat version of the new Shalimar Flacon designed by Jade Jagger last year. Instead of leather, the bottle is adorned with a blue tassel. 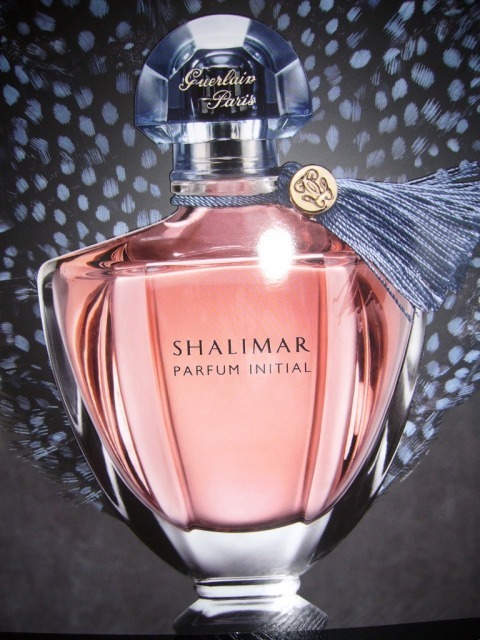 Shalimar Parfum Initial is available in 40, 60 and 100ml Eau de Parfum and is currently exclusive to Selfridges in the UK. Overseas it is available in Guerlain Boutiques and selected Department Stores. This review is based on a bottle of Shalimar Parfum Initial purchased by myself. Posted in Feminine, Floral, Guerlain, Oriental, Perfume Reviews and tagged 2011 Release, Guerlain, Oriental, Parfum Initial, Perfume Review, Shalimar. Bookmark the permalink. Thomas, I’m so happy to read your first post/in-depth review. I think I’d be very tempted to smell this, if not for obvious reasons, but when you say the skank is gone, I’m curious to smell what Shalimar would be like without this, as well, I always thought this was the point of it, along with the vanilla/tonka. Interesting to see what other facet to Shalimar is there that I might be overlooking! Thank you Liam, and a big thank you for all of your web-design assistance! Shalimar is such a complex fragrance that losing the skank absolutely allows you to focus on its other aspects. I do also think that the smoky and civet notes (which are what make Shalimar IMHO) scare a lot of people away. Parfum Initial is for those who wanted to like Shalimar but couldn’t. I’ll include some Parfum Initial in your care package so you give it a go. And I’m glad to have helped web-design wise. FYI there were a few things in your dashboard I noticed I could tweak to make your settings, a little more search engine friendly. Drop me a mail and I can walk you through them. LOL – I’m glad you are finally getting the name. I agree that it’s a good move on Guerlain’s part, they did mention in the Perfume documentary that Guerlain like to ‘Hook them while they’re young and then keep them for life’ and PI will definitely help them in that respect. It sounds so wrong doesn’t it, “Hook them when they’re young…” I’m not surprised other bushinesses probably do the same thing with their wares too. And yes, the name… I’m so blonde at times it’s frightening! I’m not thrilled with the pink either but I after reading your review I see I would have been amiss judging this “book” by its cover. Thanks for correcting this wrong! The pink juice does seem to be off putting to us Perfumistas, mainly because we know that most pink scents are dreadful. Parfum Initial is definitely the exception to the rule. Do report back if you get to try it. Thanks Hilary, that means a lot! Love at first sniff is very apt for Parfum Initial! But thankfully now I have found your lovely blog. I am looking forward to what is to come. I am impatiently waiting for Parfum Initial to launch here, your review makes me even more curious. Thanks for stopping by Birgit! I knew it! And you just confirmed it. I don’t love it as much as the original but I would like to own a bottle. Apologies for the late reply, thank you for stopping by! How come Parfum Initial won’t be sold over there? That’s a big shame. As you said it will be sold in Guerlain boutiques (no such here) and selected department stores (so far none here had any Shalimar falnkers), based on my previous experience, anyone I might even ask will have no idea what I’m talking about. P.S. Not to mention that last time I emailed a question to Guerlain distributor here, they didn’t even reply. Ines, I should have possibly made it clearer that it’s available in Guerlain Boutiques and selected department stores at the moment but will be widely available as of September. I believe Guerlain are treating it as a major new release. Oh no. 🙂 Now you’ve given me hope. I like your take on this. I am *still* not sure what I think, after many wearings, so I’ve just been happily reading what everyone else thinks. 🙂 Cheers on the newly launched blog! Thank you, I’m glad you’ve popped along to read it! What is it about Parfum Initial that you are unsure about? Just to say that I met Madame Guerlain several times when she came into see her lawyers (where I worked) in Paris, on rue Faubourg St. Honore(accent! ), and she was always immaculately draped in head to foot fur, but particularly I do remember the scent o Shalimar on her, it was like she was Shalimar, deep into her pores. She was tiny, but magnificent. PS I bought the new Shalimar and I do like it very much… however….I think I’m of an age where the original would do better on my skin. Lovely blog, I look forward to following you more. Shalimar is most definitely better than Parfum Initial, but Wasser has done a fab job of interpreting Shalimar for a modern audience. And you’ve had a look at my blog! How nice of you – it was my little perfume story that got me started into this, I had NO idea there was a perfume blogosphere! It’s very good, very exciting, and I can’t wait to find out so much more. I’m learning so much, it’s wonderful, and I really think your pages are divine. When I lived in Germany, the strong Sterling to Mark rate meant I could afford to experiment madly with fragrance, and Shalimar was one I bought, and instantly loved forever, along with Versace Blonde (sadly discontinued) The juicy powderyness of Shalimar is something I can’t get enough of, I almost felt it was too good to be wasted on other mere mortals. So evocative. Shall be getting hold of this mutation and posting about it for sure. Happy to have found this blog! Shalimar is a classic hands down, and definitely a dressy scent for special occasions.